In a major blow for the organizers of the Mrs Arunachal 2018 pageant event, three of its winners today surrendered their titles and subtitles citing reasons ranging from post-event harassment to counterfactual marking. The recently concluded Mrs Arunachal 2018 event which was organized by the Muskan Women Foundation in collaboration with the Ane Abo MPC, is already getting criticism in the public domain for hosting the event in a haphazard manner, 70:30 marking ratio, etc. Addressing a press conference at the Arunachal Press Club here, Uma Natung Rimo, who was adjudged as the 3rd runner-up of the title and Best Costume subtitle, informed that the committee members of the Mrs Arunachal 2018 have been continuously making “personal attacks” and intimidating her even after the event. The other two title winners who surrendered their respective titles on Saturday are Jingchang Chai (2nd Runners-Up in Classic Category and Best Hair subtitle) and Ranjita Tamblu Chai (Best Hair subtitle winner) from Lohit and Anini also come against the organisers respectively. Responding to the media over not receiving cash amount, Jingchang informed that she received a blank envelop which was supposed to enclose the cash award amount of Rs 50000. 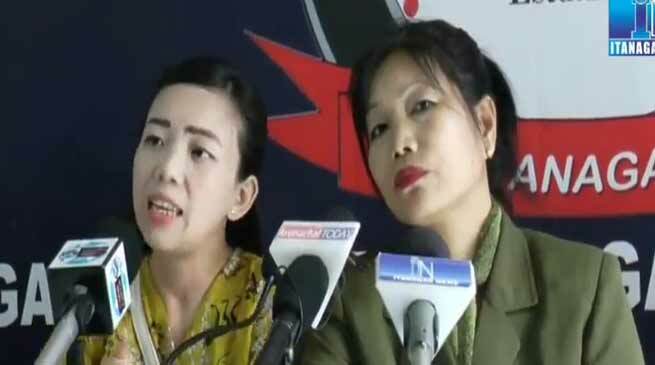 Meanwhile, Women Welfare Organization East Kameng former secretary Puja Sonam Natung criticised the Mrs Arunachal 2018 for hurting the sentiments of the contestants in particular and womenfolk in the state in general. She said that many womenfolk across the state aspire to take part in the event but the manner in which the event was organized has degraded its image. Natung also said that the participants are mothers first and contestants later and that fact should have been respected.